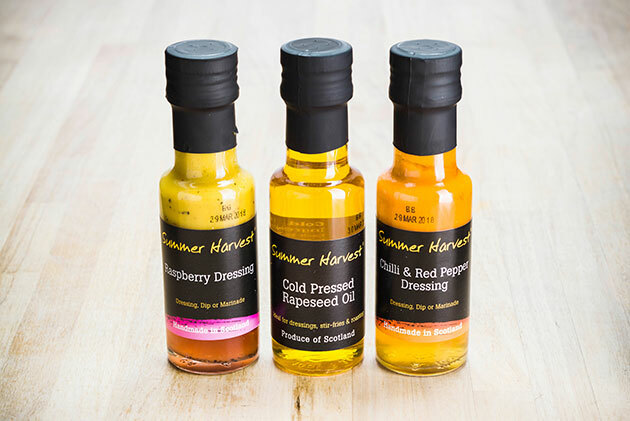 Mark and Maggie Bush farm in nearby Perthshire and use their own rapeseed to produce a range of high quality oils and salad dressings. Rapeseed oil is low in saturated fat and contains omegas 3, 6 and 9 which reduce cholestoral. The rapeseed is cold pressed providing a delicate flavour - this is equivalent to a good extra virgin olive oil. The dressings are made using fruit and vinegars from a local fruit farm. This pack of three is ideal to use during your stay or can be wrapped by us to take home as a gift for family or friends.